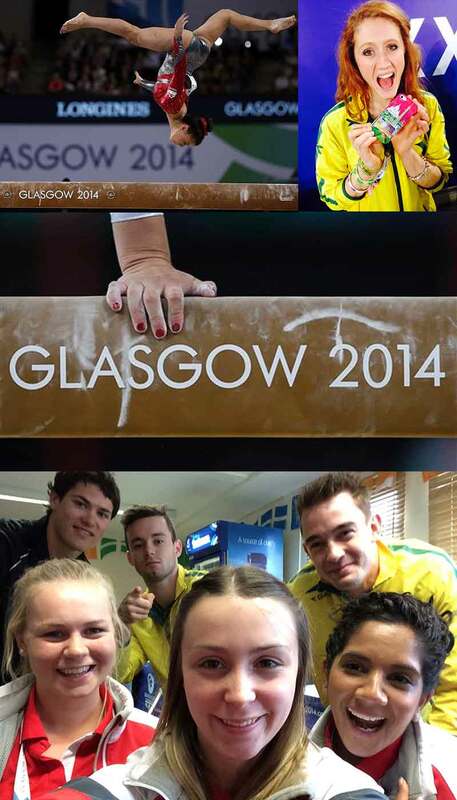 Claudia Fragapane (top left), Olivia Vivian (top right), and Glawgow volunteer Jamie Day (center bottom). Did Australian head coach, Peggy Liddick’s controversial plan to take potential event medalists and leaving their all-around champion at home. Our fears that the British media are portraying Fragapane as the next world champion and will set her up for unreasonable expectations. Katie tells us what it was like to volunteer in Glasgow for gymnastics and be forced to eat candy! Dipa Karmakar’s double front vault. Was it worthy of it’s namesake, the great Produnova? Louis Smith and Dan Keatings carrying an injured Sam Oldham onto the podium for his gold medal in a Kerry Strug-esque moment of glory. The most anticipated pommel horse show down since the 2012 Olympic Games. The fantastic attitude of Becky Downie who competed injured for a title on bars but three falls on beam. The gym-romance between Hannah Whelan and Sam Oldham. Will Max Whitlock challenge for an all-around medal at Worlds? Ellie Black vs. Claudia Fragapane in the vault finals–we discuss whether or not the outcome was fair. Olivia Vivian, Miss Congeniality of the gymnastics world. The massive improvement of the Welsh girls and Indian women’s gymnastics. An Inside View of gymnastics at the Commonwealth Games – by from our friend MIchelle Webb who volunteered in media at the games. I was, and still am, skeptical about the team format. The reason they did it was because they didn’t have enough of the most highly qualified judges to run all the panels simultaneously. That makes me wonder if there are rules against judges from non-competing nations judging or if it was a money thing in forking out for extra officials. One good thing about the way they organised the countries was that it meant spectators got to cheer on gymnasts from just about every country. All the big teams except Wales had MAG in one session and WAG in the other. That was very nice for the fans and it also meant gymnasts could watch their male/female counterparts perform. Of course the big consequence of the country draw was that MAG medals were decided in the first session and WAG medals in the second. That meant those that paid more for “finals” tickets only saw half the competition be decided but it was great for the session one spectators who didn’t get to see the medal ceremony but saw the big MAG England v Scotland battle. I would be interested to know what the gymnasts thought of it. I’m curious how being able to focus on limited events per day stacked up against being different and having to compete multiple days in a row. As a trampolinist I would be perturbed having to compete set and voluntary routines on different days, I’d prefer to get it done and out of the way! I guess there was the potential for tactics to change based on day one scores but I’m not sure we saw any of that. The announcer was good about explaining which teams were coming in and out. Teams were marched in and out at the same times as other groups were rotating events so it was a bit disjointed. With so much going on it was extremely difficult to keep track of the scores. The main scoreboard had MAG and WAG scores, subdivisions and rotation numbers and was probably tricky to follow for newbies. I’m not sure the non-gym nerds were too bothered but I found it had less ebb and flow than a normal team competition. I always remember Barry Davies (God) being disparaging about Romania winning Sydney TF while sitting on the sidelines. Having a score to chase is less dramatic than everyone competing at the same time although it does give you more time with the calculator. I’d say that the format was very good for newbies as they got a heck of a lot of variety with MAG, WAG and many countries. 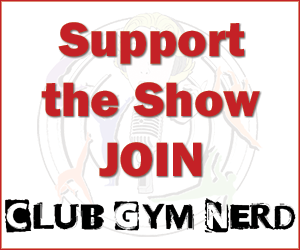 I think gym nerds would prefer the better focus the traditional format provides. Can we please ship CWG gymnasts to Marta and teach them to stay on the fecking beam? I’ve never seen so many smiles in a WAG AA competition, lovely to watch gymnasts be chuffed with their performances and enjoying themselves. The cameraderie between all the gymnasts was great. Particularly liked seeing the Scotland and England coaches shaking hands/high fiving during the march rounds. Singapore WAG are a nice team, smart form and decent difficulty. Watching gymnasts from smaller nations is a good reminder of how difficult gymnastics really is. It is easy to forget the level of preparation giants and basic ring moves require when you just watch top teams. Rhian Pugh (2004 Junior Euro bar champ) was judging. She was a line judge during the team competition and I think a timing official for UB finals. Pretty neat that she was officiating at a competition including the Zuchold which was in her routine back in the day. The music played was matched to the gymnasts going. When Wales had performed and Welsh fans dressed as daffodils were shown in the audience they played “Delilah” by Welsh artist Tom Jones. After Ruby Harrold finished on bars they played “Ruby ruby ruby” by the Kaiser Chiefs! Craig Heap taking pictures of his screen for the England 1-2-3 and Christine doing the same when her gymnast Georgina Hockenhull won bronze on beam. I got to go on the field of play to move photographers’ benches around during RSG podium training. They were also used in London and still had 2012 stickers on them. Nice to see things being re-used in a sustainable games. For the team and HB medal ceremonies I moonlighted in the mixed zone where my job was to walk gymnasts from the broadcast area to the written press mixed zone. Such a cool job and being there meant I could listen in on the interviews. Peggy and Lauren both said that they were the third ranked country going in and that they won silver rather than it being a disappointment. Peggy also mentioned her team being under-prepared, will peak for worlds and that she’s happy they were all healthy. All the medallists got a bag of goodies which included a frame/mount thing for their medals. It was proper amusing to see the judges all trying to get pictures with Louis while the volunteers were trying to shepard him to journalists. After the VT medal ceremony Dipa ran up to her coach to hang her bronze around his neck. Whatever you think about her vaulting and their strategy it was a cute moment. Multiple journalists had never covered the sport before and asked me to explain what was going on. PERFECT job for me! I felt sorry for them being so out of their comfort zone but some of the errors I saw in articles were inexcusable and could have been solved with a quick google (China are world leaders in WAG) or glance at the information we gave them (Louis features in AA finals) grrrrrrr! I just loved using my gym nerd powers and explaining what was going on to my team of volunteers and journalists who asked. Various games were played with the audience to keep the energy levels high. Some of these applied to all the CWG venues but they are extra relevant to gymnastics given the down times between routines and that worlds is at the same venue next year. “Weegie wave” was a term coined for the Games as far as I’m aware. This is a “Mexican wave” or “the wave” depending on where you are from. I was given blank looks at a US summer camp when I suggested a Mexican wave, once I explained it I was told the American name and that I shouldn’t be racist! The same thing happened with Chinese whispers/telephone. Anyway, they got this going a lot and the audience had to race an electronic Clyde (Games mascot) around the arena. There was also a super slo-mo version where they asked the audience to be as graceful as the gymnasts. Kiss-cam/highland dancing cam/air guitar cam. For this they would show members of the audience and get them to do as they were told. Most people were up for it. Notable events were getting the announcer on kiss-cam, Louis vs a NZ gymnasts on air guitar cam (as you can imagine Louis went for it) and the highlight was the Dan’s on highland dancing cam. They were resolutely not up for it. Keatings just laughed and made jokes while Purvis gave us some head bopping. Such a shame! There was an announcer who roved the audience doing interviews with kids and getting people to participate in the 30 second challenge. Variations of this were name countries in the CW, sports in the CWG, fruit, vegetables. Then they’d play a video of a sports star doing the same to see who would win. Speaking of videos they had Beth reminiscing about her UB title in Manchester and Steve Frew doing the same about SR (which shockingly they cut off before the SR ceremony that he presented at). There were also videos for each apparatus and they were actually pretty detailed, going as far as describing the special requirements on PH. There were several acrobatic gymnastics performances from the GB juniors which were very well received. The 2015 worlds were publicised a lot with the announcer mentioning that tickets had almost sold out. All the noobs adored Claudia. There were lots of height comments. Super young kids around me kept asking their parents when Louis would be on, he’s so well known now. Some on my team commented on the scary vauting of the Indian WAGs. None of them had any gymnastics knowledge and were fairly non-plussed about volunteering at this venue but 80% loved it, thought gymnastics was amazing and will be watching Tumble. I went to the 2nd day of team finals, the second session. While I liked the idea of splitting the events to begin with because I got to see the teams I wanted, and the two events were my faves I just felt like the whole thing was disjointed and over and done with.. They did do one at a time which I guess was nice for the spectators to see everyone, the men just seemed to be doing their own thing and honestly, I barely even noticed they were there! The announcer barely announced them – I realise that those teams werent medal contenders but it just seemed unfair that all the focus was on the females. I did like the arena though! We were up the top, but still had an amazing view and I could tell which gymnast was which and see really well – my complaint was that a lighting rig was blocking the big screen for scores. I have tickets for both days of qualifications for Worlds next year in the same arena and I’m really excited as I have seats lower down! I think gymnastics is on the rise in Scotland at least fan wise – the world cup in Glasgow is always well attended now (not just in 2012 after London) and hopefully Worlds is as well!! I too love Fragapane but am concerned about the hype. However,the quote you mentioned about ‘there aren’t girls anywhere in the world who can do what she can do.’ was not from Fragapane’s personal coach but Craig Heap. You can see it in the article above. (I remember it quite distinctly as I too rolled my eyes when I read that one!!) He’s a former gymnast and commentates with Christine Still and Matt Baker when Mitch Fenner isn’t around (often when Epke’s competing). This is the same guy who got really excited at Euros when a gymnast (perhaps Meneghini?) performed an average 1.5 yurchenko because he thought it was an Amanar. It’s a shame he’s the one journalists go to for ‘expert opinion’. Although Fragapane’s coach mentions her routine being ‘world class’, I think she’s pretty grounded and has more realistic expections. Michelle you’re so right about Barry Davies being God! I thought he did such a fantastic job of the ‘Al Trautwig’ type of non-gym commentator (I think he was put into gym commentary because his daughter was a gymnast or something?). I love this interview he did about Kerri Strug and 1996: https://www.youtube.com/watch?v=gEkg_8BRSY4. You guys should totally have him on the show!